Genebank users – breeders, other scientists inside and outside the CGIAR and even farmers – need to be able to find and access the plant genetic resources most likely to help them. Improving the information systems of genebanks will result in more effective use of collections. Several challenges stand in the way of better information on plant genetic resources in genebanks. Different information systems store data using different schema. Information about an accession may be stored in several independent databases. The identity of an accession may not be preserved across all information about that accession. The Genebank Platform will work closely with the CGIAR’s other platforms on Excellence in Breeding and Big Data, as well as with the Global Information System (GLIS) of the ITPGRFA, to facilitate cooperation and interoperability among new datasets and genebank passport data. Genesys provides a common portal for access to information on all CGIAR accessions and is recognized as an element of the ITPGRFA’s GLIS. The Platform’s Conservation and Use modules will contribute to Genesys, developing new tools and methods for sharing, associating, and harvesting accession-level data. Enhancements to Genesys will focus on interoperability and on the ability to communicate with databases that share standards. A key element will be a common system for the unique identification and tracking of germplasm samples (accessions and their progeny and other derivatives) through the use of Permanent Unique Identifiers (PUIs), so that data can be securely associated with specific accessions in genebanks. GRIN Global is software that enables genebanks to store and manage information associated with plant genetic resources for more effective genebank operations. It has been developed by USDA with support from the Crop Trust and Bioversity International. Six CGIAR genebanks (CIP, CIMMYT, CIAT, ILRI, ICRISAT and IITA) are adopting GRIN-Global as their primary genebank information system. Collective development of GRIN-Global as part of the Platform’s activities will facilitate the integration of data for analysis and access across Centres and will help to make information globally available and more useful. With the rising capabilities and falling cost of mobile devices, genebanks have a great opportunity to streamline their data gathering and management. Tablet computers, mobile phones, portable label printers and other devices have a growing role to play during field regeneration and characterization and during collecting missions. Aside from the ease of gathering, storing and transmitting information, mobile devices also reduce opportunities for error. 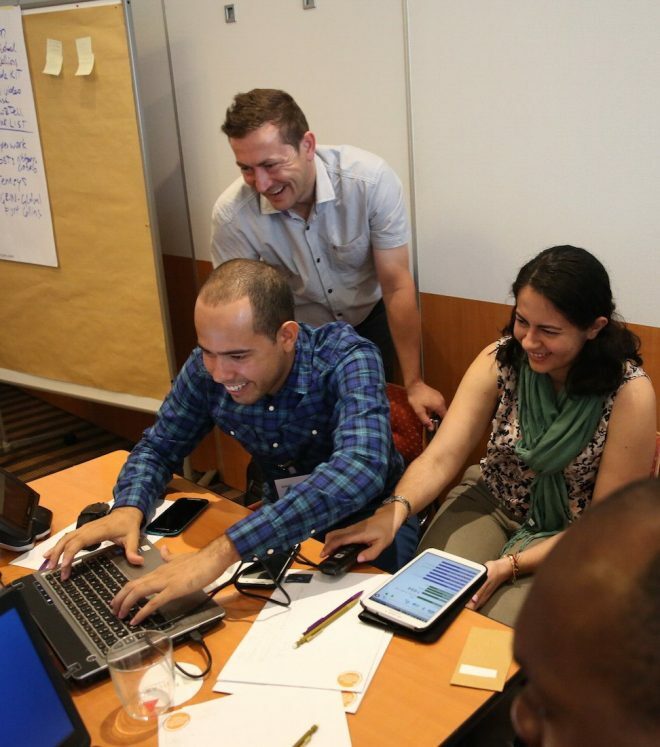 CGIAR genebanks are using portable devices and barcoding for a large part of their operations. They are also developing GRIN-Global to be able to support mobile genebanking for all users. The Platform will ensure that all of its information products are made publicly available in conformity with the CGIAR Open Access and Data Management Policy and with the ITPGRFA expectation that non-confidential information about materials in the Multilateral System will be made available through a global information system.